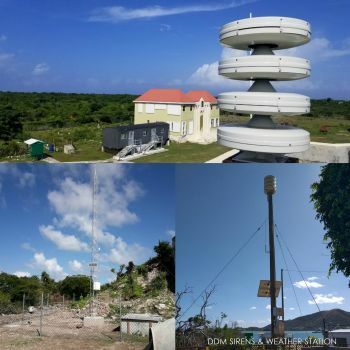 ROAD TOWN, Tortola, VI - The Government of the Virgin Islands will be financing the re-establishment and upgrade of a Territory-wide Multi Hazard Early Warning System to the tune of $1.5 million dollars. This is according to a release from the Government Information Service (GIS) which says Following the passage of hurricanes Irma and Maria in 2017, an allocation of approximately half a million dollars was spent as part of the 100 day rehabilitation plan to re-establish critical elements of the system. This included the purchase of six sirens, 18 weather stations, five Seismic Units, five encoders and 100 Smart Radios which have now been installed at all schools throughout the Territory. An additional $900,000 was allocated in the Rehabilitation and Reconstruction Loan (RRL) to upgrade the networks and expand the coverage. Director of Projects in the Ministry of Finance, Dr. Drexel Glasgow who is serving as the Project Coordinator for the implementation of the RRL activities said the Projects Unit has so far been able to secure most of the equipment. These, he said, included an additional five weather stations, an extensive array of Emergency Telecommunications equipment, 250 Radio Data Systems receivers, AM and FM transmitters, Amateur Radio Equipment, Satellite Communications Units, an additional nine sirens, five Strong Motion Sensors to record earthquake activities, two Tidal Gauges to be installed at Gun Creek on Virgin Gorda and Cane Garden Bay on Tortola and Emergency Broadcast Units to connect all radio stations operating in the Territory. Dr. Glasgow said the extent of the network is directly related to the geographical spread of the islands and the type of hazards that can impact the Territory. He explained that there is an urgent need for these systems to be in place to monitor activities and to provide immediate warning to residents and visitors. The expansive network will reach beyond the four main islands as at the end of this project, the Department of Disaster Management (DDM) would have installed nearly 400 sites with some form of communication, through the support of the RRL. The project is part of the extensive Readiness Plan that was presented to the National Disaster Management Council on March 28. The installation, upkeep and maintenance of the system is being carried out by public officers within the Department of Disaster Management and supported by a number of technical departments including the Department of Information Technology and the Telephone Services Management Unit. Dr. Glasgow noted that these departments have demonstrated that they have the technical capacity, knowledge and skills to guide the procurement of these units and to carry out the installation works required. “We must recognise and acknowledge the tremendous investment that has been made in training public servants to be able to design and maintain these types of networks. With the support of telecommunication providers and media outlets we will be in a much better position than we were prior to the impacts from Hurricanes Irma and Maria,” he concluded. Multi Hazard Early Warning Systems (MHEWS) are well recognized as a critical life-saving tools expected to provide: detection, monitoring and forecasting hazards; analysis of risks involved; and dissemination of timely warnings and activation of emergency plans to prepare and respond. The DDM is building the new network using the guidelines established by the World Meteorological Organization (WMO) Disaster Risk Reduction Services Division.